It’s time for the king to prove itself once again. It’s no secret that “World of Warcraft” has ruled the roost of MMORPGs (that’s “massively multiplayer online role-playing game,” for the uninitiated) since its release in 2004. Many challengers have tried to dethrone it, with just about every new entry failing to conquer the juggernaut that basically reinvented the online role-playing wheel. Even today, the rookies just keep on coming, with giant productions like “Final Fantasy XIV,” “Star Wars: The Old Republic” and “Tera” all falling flat in comparison. Let’s remember something, though. It’s almost WoW’s eighth anniversary. It’s getting kind of old. And with the bombastic release of “Guild Wars 2” and the announcement of the online iteration of the celebrated Elder Scrolls series, WoW needs to reassure its fan base that it still has what it takes to compete. The MMORPG landscape is changing. Three expansions (“The Burning Crusade,” “Wrath of the Lich King” and “Cataclysm”) for WoW have already been released. 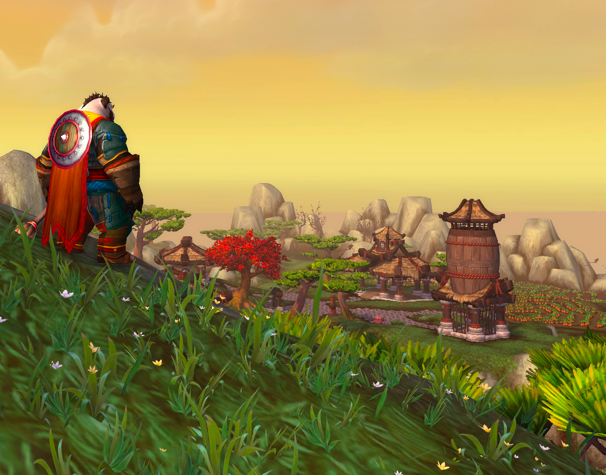 Can “Mists of Pandaria” possibly change the World even further, and for the better? The short answer is yes. The long answer is a bit more complicated than that. Mists of Pandaria immediately shows its dedication to change by completely redesigning the character skill customization systems. Gone are the old “talent trees” that gave three distinct paths to take as you leveled up your character. In place now is a “specialization system” that gives you a clear-cut choice between three styles once the player hits level 10. For example, a mage must now decide straight out if it wants to specialize in arcane, fire or frost magic. It may seem to be almost blasphemous from the eyes of a veteran, but all that Mists of Pandaria is doing is embracing the conventions that the original WoW helped to create. The “holy trinity” of the tank, healer and DPS roles is still intact, but certain classes no longer need to conform to the supposed “perfect” build. There is much more room for creativity now. Skills come automatically (no longer requiring a trainer and gold), but every 15 levels gives a choice between three new talents, and the glyph system allows a flexible set of buffs to be applied at any time. Veterans won’t miss the talent trees for long. The new system is easy, intuitive and fun to experiment with. For the new players, it is simple to grasp. Also new in the expansion is the Pandaren race and the continent of Pandaria. The Pandaren is the first race to not be allied with either the Alliance or Horde from the start; that decision is made once the character leaves the new (and gorgeous) starting zone. The monk appears as a strange and agile hybrid class that bluntly gives you the choice between being a tank, healer or DPS as its level 10 specialization. They’re powerful, but almost any race can be one, so no harm is done. Pandaria is the new landmass available for exploration as high-leveled characters make the jump from level 85 to the new maximum level 90. In continuing with tradition, new and challenging instances and raids have been added, and a new challenge mode has been added that rewards groups for completing them in the shortest time possible. It all amounts to a good addition to the end game experience. The new additions hit all of the right notes. Even the minor add-ons like Pokémon-style pet battles are nifty. However, the big question still remains: should you get it? Veterans, I now speak directly to you. We all know you’re probably going to get this, if you haven’t already. It’s a great expansion, and you won’t regret it. For newcomers wondering if it’s time to finally join the World…it’s not. Mists of Pandaria is an awesome addition, but if you haven’t been sold on WoW in the past, the changes here are not drastic enough to warrant another look. The landscape is changing and promising new challengers are on the way…including Guild Wars 2. Stay tuned.